Stpgr Aalborg-Flak. Stützpunkt leichter Flakzug Lindholm II, Widerstandsnest and Funksendestelle Aalborg-Vesterallee were visited. In 2012 we paid a visit to the Flak Batterie Vadum and the Gefechtsstand Skovbakke. The Stpgr Aalborg-Flak can be found on the southern bank of the Limfjord and has bunkertypes L 483 and L 494. We are not sure what we have found here. Maybe some day there will be more time to discover more of Aalborgs secrets. All pictures by Henk Adriaanse. 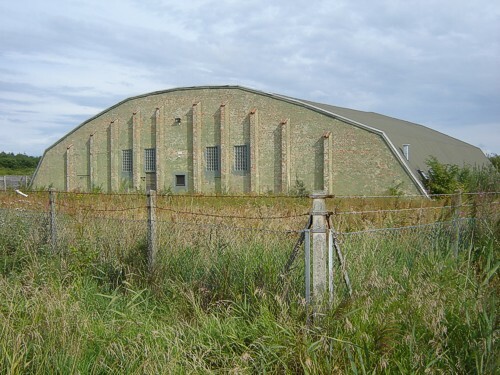 Hangar on the airfield nearby Stützpunkt A.